How do you visit one of the original national parks and get an image that no one else has gotten? The short answer is you don't. This magical place was made famous by the famed naturalist, John Muir, and brilliantly documented by photographer Ansel Adams. Since then, photographers have flocked to the Sierra Nevada mountain range in eastern California to walk in their footsteps. I'll be the first to freely admit that there may be some small section of the park that hasn't been photographed, but who knows for sure? Enthusiast photographers, like myself, go there for the beauty and ruggedness of the landscapes, and, at the same time, to walk in the footsteps of these pioneers. One of my favorite formations in the park is Half Dome. It is a uniquely shaped formation ,where it looks like half of the dome has fallen away, leaving a sheer flat side. Geologists believe that 80% of the dome still remains. 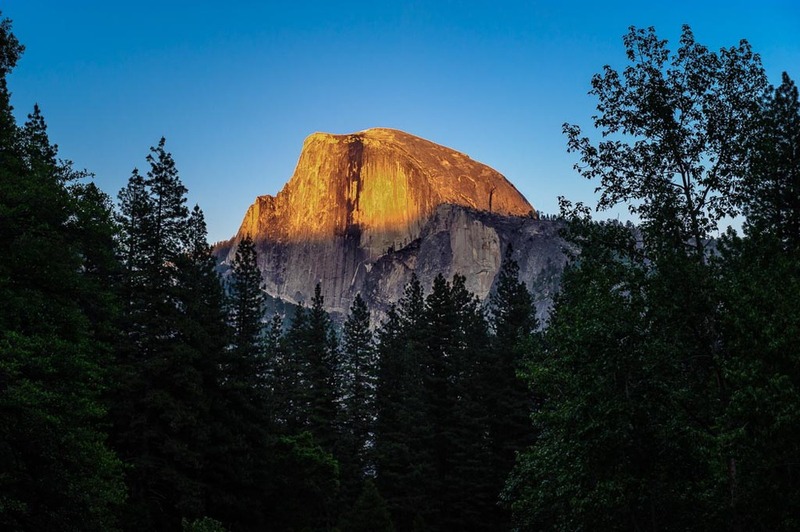 This angle of Half Dome is from Sentinel Bridge during sunset. It is fascinating watching the shadows slowly crawl up the formation until the tip is the only thing that is lit.